EDIT: as of January, 2019 The Meet has gone permanent. We'll raise a vegan pisco sour to that. Indulgent, plant-based comfort food. That's the remit of Clapham North's new vegan pop-up, The Meet. It's not the most obvious spot for vegan indulgence. It's time-sharing a Clapham railway arch with late-night club Fu Manchu, in a space that's industrial-bare meets eighties uplighting. There's little sign from the street of life or comfort food inside. But the menu talks a convincing game — curries, burgers and assorted Americana, desserts and a mix of vegan cocktails (cashew milk White Russians, amaretto sours with egg-white substitute). Our waiter tells us that vegan-sceptics dragged here often land on the Mc Who? soya-cheeseburger as a reassuringly heavy, meaty option. But while there are plenty of substitute foods on the menu — 'bacon' rashers on the burgers, grilled 'cheese' sandwiches, hardshakes made with vegan ice cream — it's the straight-up, honest-talking, nothing-resembling-meat dishes that leave us dazzled. 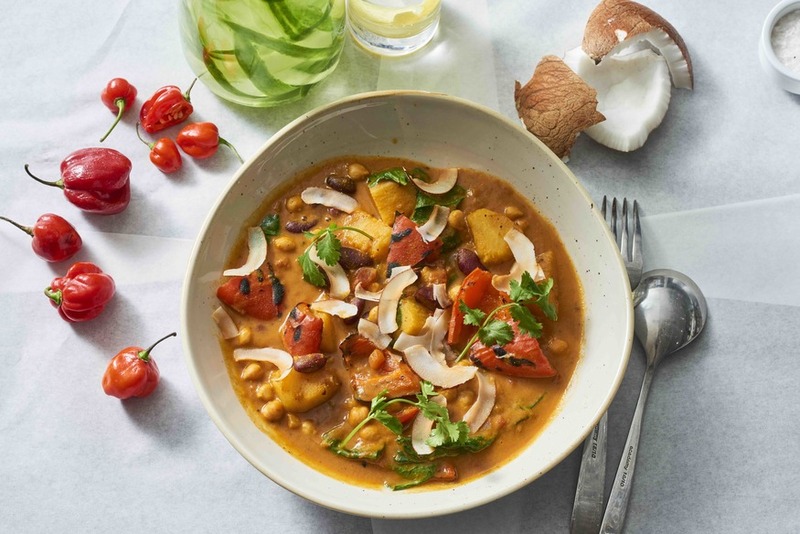 The Ain't It Cold Out is a Jamaican-style curry with roasted yam, peppers, spinach and chickpeas — hearty enough to leave us nearly unable to finish it, lovely enough to have us persevering through to mop up the last traces with our rotis. The Jerkin' Around is a sweet, hot wrap stuffed with jerk tofu, plantain, scotch bonnet sauce and pineapple salsa. The only imperfect note in the entire thing is the bed of crisps it comes on, a nice sandwich-and-crisps comfort food throwback, but warmed and dampened by the sauces. Starters are similarly spot-on when it comes to indulgence. The Green Giant — a plate of broccoli, avocado and tofu, tossed through with satay — has been conjured into something salty and rich. The mac and cheese, which we order mistrustfully — on the basis that fake cheese is one of the most disappointing vegan foodstuffs out there — turns out to be velvety and brilliant, the cheese sauce made in-house, and sidestepping that gluey plastic texture of the stuff you often find ruining otherwise great vegan pizzas. Portions are generous and rich, so much so that the main dishes make us nearly regret the starters — but then the starters left us wishing we'd ordered double of both. The answer's probably to share a starter and main between two, leave room for a bourbon-laced hardshake dessert, and finish your meal thoroughly contented but still able to walk out, rather than be rolled. The Meet is confirmed to be at that space until the end of January 2019 for now — though there's talk of a six-month extension. It's an extension that by the end of our shortish visit, we're hoping for earnestly. Neither of us are vegan, but both of us are smitten. The Meet, 15 Lendal Terrace, SW4 7UX. Looking for more vegan indulgence? Check out our list of London's best vegan desserts and best vegan street food.